AKG K845BT review | What Hi-Fi? AKG is no stranger to five-star reviews in our magazine – so the fact that the K845BT wireless headphones are talented comes as no surprise. It’s tough to take even a glimpse at these headphones and not mention their hefty size, compared with their rivals. AKG’s larger-than-average ear pads aren’t just there to raise eyebrows though: inside each is a 5cm driver. And big drivers promise strong dynamics and good bass reach. Still, though they look the part, the K845BTs are bigger – and heavier – than most Bluetooth headphones we’ve tried. Therefore, they aren’t as convenient for the daily commute as they perhaps should be. The lack of a carry case doesn’t help their cause here either. You do get a USB charging cable, however, and a 3.5mm audio cable so you can opt for a wired connection if you run out of Bluetooth juice. We put on a black pair (they also come in white), and the pads fitted securely over our ears, feeling pleasantly roomy inside. Our ears did get a little hot after 45 minutes of listening, though, and we’d imagine a continuous eight-hour transatlantic session – which is what you should get from a full three-hour charge – would be nearly unbearable. We also felt that the headband could do with more cushioning. They do, however, isolate you well from external noise, so it’s all about you and your music (or the voice of your mum during hands-free calling). The controls on the right earcup are easy to use – push the Bluetooth pairing button once to pair the K845BTs with your device, and hold it down to unpair. There’s also a small play/pause button (which also answers and ends phone calls) sandwiched between volume up down controls. What stumped us was that there didn’t appear to be controls to skip tracks, which seems at considerable odds with the very point of wireless cans. You shouldn’t have to turn to your portable device every time you want to skip Agadoo. 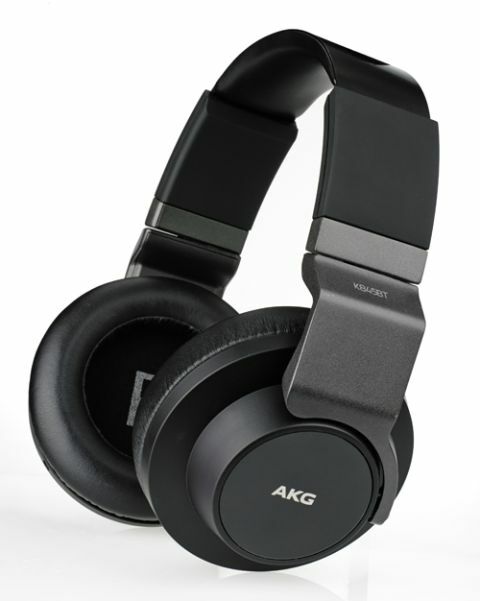 The AKGs might not have the higher-quality aptX version of Bluetooth (they run Bluetooth 3.0 + HS) but they do have the benefit of NFC (near-field communication), which gives you the fuss-free option of pairing them to a compatible device instantly by simply touching the two together. Which is what we did before powering up our playlist. It’s not only the K845BTs’ appearance that inspires confidence. We get half way through playing The Cure’s Friday I’m In Love and, like with the Award-winning AKG K550s, it’s plain to hear the impact of those large drive units. They produce an incredibly clear sound – crisp, detailed, open and precise across the frequency spectrum. They don’t shy away from Frankie Valli’s high notes, but they don’t make them sound uncomfortably piercing either. We sought a similarly high standard from the bass, and, when playing The Darkness’s Love Is Only A Feeling at high volume, got a firm, defined bass. In fact, everything we played was delivered with a sense of effortless cohesion. But we didn’t find them quite as entertaining as the Philips Fidelio M1BTs, due to their less expressive dynamics and lack of exuberant rhythmic ability. Nor were they as forgiving with poorer-quality recordings, overemphasizing faults in some tracks on occasion. Switching to a cable connection did, however, take the edge off this slight aggressiveness, and further accentuated the overall musicality of their sound. All in all, if you like your music clear and uncoloured, the AKG845BTs are well worth an audition. We’re delighted to see AKG continue its inspiring form with its wireless range, and if you can see past their size and less-than-perfect functionality, these are some of the best cans of their kind to carry around.